As I prepared for baby Evy to come along, I spent hours of research on the best products out there. I was one of those crazy preggo mamas that went to Babies R' Us every week to tweak and add items to my registry. I even changed my car seat a day before she came, talk about cutting it close! A favorite blog of mine wrote about their 'Top Five Lifesavers' when they had their first bambino. I'm not a follower, but in this case, I thought I would share my own version of my favorite things, because who knows, it may help a new mama out there get through those first few months of mommyhood. 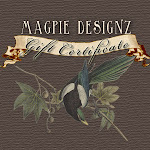 Don't get too excited, I'm not Oprah, so there isn't a fantastic giveaway at the end of this post. I couldn't do just five lifesavers like YHL, just because there have been so many items that have helped keep me sane for these past four months. 1. Summer Infant Swaddle seen here. Yeah yeah, you've all heard of swaddling, it's not a new concept. The old fashioned way of swaddling by using the hospital blanket doesn't work all that great if you have a little one that likes to get their limbs free. The velcro on this swaddle is key! This blanket was my saving grace when it came to getting her to sleep in 2-3 hour stretches. 2. The iPhone app called Baby Brain. This app was a godsend when it came to keeping track of those diapers and feedings in the early weeks. My sleep deprived and drugged up mind could not even remember the name of my brand new child, yet alone the important details of nursing :) The rubber band switch-a-roo on the wrist trick wasn't cutting it. For $2.99, this baby log gave me a sense of organization amongst the chaos. 3. Gas drops and Gripe water. 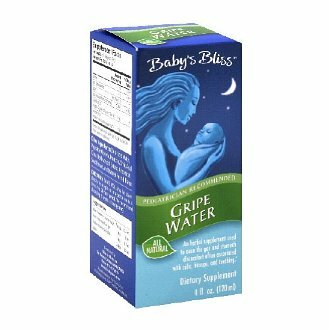 Gripe water is a natural herbal digestive aid for babies to ease the discomfort due to colic, gas, hiccups and teething. 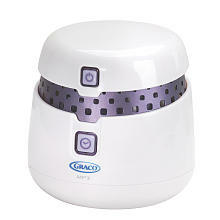 Evy tends to be extra gassy and having these two items have been a lifesaver for us. The gas drops are wonderful for the typical upset tummy, but the gripe water work wonders for a fussy, constipated, and reflux baby. It seems to soothe her right away, sometimes putting her to sleep in minutes. Both are perfectly safe and healthy for babies. 4. This video monitor. I know that it is a luxury item and definitely not needed if the budget is tight. We splurged on this monitor and are so glad we did. For this first time paranoid mother, the fact that I can just sneak a peak at my baby in her crib gives me a sense of peace. This way I don't have to get up every 5 minutes to peak in her room, taking a risk of waking her up with our creaky doors. It will come in handy when shes a toddler too, that way I can spy on her as she gets into trouble during her "nap-time". *this video captures her afters she rolls over in her crib for the first time. I wouldn't of witnessed this cuteness if I didn't have the video monitor. Have I sold you yet? 5. Moby Wrap. Oh how I love you Moby. You have allowed me to eat, vacuum, cook and even sleep with my baby attached to me. I heard mixed reviews about the Moby Wrap when I was doing my months of research- the consensus was that you either love it or hate it. I absolutely LOVE it. Yes, it was difficult at first to get the hang of wrapping yourself with 6 feet of jersey fabric, but after a few times you get the hang of it. Evy loves being snuggled up with me and I love having her close, mostly so I can smell her sweet head. It gave her the sense of being in the womb for the first couple of months, which was a great comfort for her. Now at four months, I use it with her facing out so she can explore her surroundings a bit. 6. Sound Machine. This machine is wonderful! My goal for the first couple of months was to make Evy's surroundings as womb-like as possible, hence babywearing with the Moby Wrap and this sound machine. It has a womb-like sound that is very similar to what she heard for 9 months. I was hesitate about getting her attached to a "prop" as many baby books warn you of, but I went with my gut on this one and am so glad I did. The sounds soothe her to sleep and give her a sense of comfort if she wakes up in the night. And let's face it, when you live in a home that's 100 years old, you need something to drown out the creaky wood floors and squeaky doors. Oh and it also has a MP3 feature so we can hook up our ipod in the future when the meatball wants to listen to music or a book on tape as she falls asleep. 7. 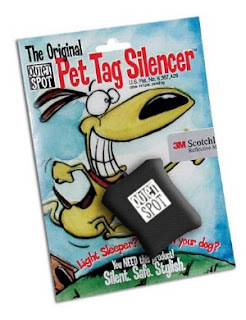 While we are on the topic of noise, this dog tag silencer is a must have for any dog owner who has a pup that likes to obnoxiously shake it's head to get your attention. It's not the most attractive thing I've ever seen, but who cares. She can shake all she wants now. Go ahead Maisey, I dare you. 8. Sheet savers. Whoever invented these is a genius in my book. Instead of changing the crib sheets every other day due to spit up, all I do is change these suckers. They are soft and cozy for her head to rest on too. 9. Travel Diaper Changing Pad. Many of you moms have these, so it's nothing new or terribly exciting but I didn't think of it when registering. Good thing I have a sister who knows what I needed after raising three kiddos. There are tons of prints and styles to choose from out there! These are handy when changing in the car or on your friends guestroom bed, especially when the babe decides to relieve herself mid diaper change. 10. 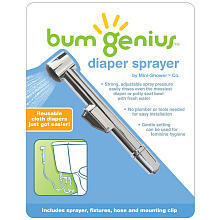 For all you cloth diapering mommas out there, this diaper sprayer is my BFF. Since the poo's aren't exactly solid yet, using the sprayer is a quick and efficient way to get off all the yuckiness before washing. It takes some practice in the beginning to get the poo in the pot. I have switched out our tooth brushes and washed the shower curtain several times after a few bad experiences. Love it! I always enjoy seeing what other mama's favorite things are! I, too, love the moby wrap and wouldn't survive without our diaper sprayer - best invention ever! That app for your phone is amazing! Wish I had a smartphone to use it on! :( So handy! Hope you and Evy are doing well! We are hoping to make it down to CT to meet Evy and Baby Sylvester sometime this year! Miss you guys! I love the dog tag silencer!! We used everything else on your list for our son (now 4) - don't be concerned with using a sound machine. It is the best for giving you a buffer and I promise, she won't take it to college (quite frankly, I'd be happy if he took one to college, maybe he'd go to sleep earlier?).. Congratulations, hope you're enjoying some QT with that sweet baby! Since when compared to a excessive priced unit, you will nonetheless be able to taste the distinction, and it might be a large 1! However to become sincere it all depends on your personal taste and also the cup of coffee that any espresso machine could make for you. This vacuum cleaner bags tend to be extremely effective in keeping allergens and air particles out of the air, trapping them inside the vacuum bag. As a general rule, try to avoid plastics numbers 3, 6 & 7 while opting to choose type #5 (polypropylene)if possible.